Two-dimensional (2D) lamellar materials have unique molecular structures and mechanical properties, among which molybdenum disulfide (MoS2) and graphitic carbon nitride (g-C3N4) with different interaction forces served as reinforcing phase for polytetrafluoroethylene (PTFE) composites in the present study. Thermal stability, tribological and thermomechanical properties of composites were comprehensively investigated. It was demonstrated that g-C3N4 improved elastic deformation resistance and thermal degradation characteristics. The addition of g-C3N4 significantly enhanced anti-wear performance under different loads and speeds. 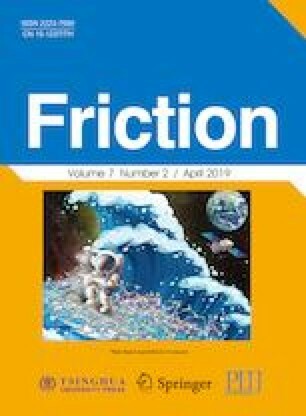 The results indicated that PTFE composites reinforced by g-C3N4 were provided with better properties because the bonding strength of g-C3N4 derived from hydrogen bonds (H-bonds) was stronger than that of MoS2 with van der Waals force. Consequently, g-C3N4 exhibited better thermomechanical and tribological properties. The result of this work is expected to provide a new kind of functional filler for enhancing the tribological properties of polymer composites. Qihua WANG. He graduated from North Western Polytechnical University with a bachelor’s degree in engineering in July 1990 and a Ph.D. degree in Lanzhou Institute of Chemical Physics, Chinese Academy of Sciences in July 1998. In 2004, he worked as a senior visiting scholar at the Department of Chemistry at the University of Houston, USA. He is currently a researcher and doctoral supervisor. He is the winner of the National Outstanding Youth Fund and his current research interests include composite tribology, space environmental material failure behavior and mechanism, and lubrication materials and sealing techniques under severe conditions. He has published more than 100 papers in important journals at domestic and international. As a group leader, he has under taken more than 20 research projects. Song LI. He is a Ph.D. candidate in the Lanzhou Institute of Chemical Physics, Chinese Academy of Sciences, University of Chinese Academy of Sciences. His research is focused on the tribological problems in ultrasonic motors, and the development of polymer-based friction material. The authors would like to thank the financial support from National Basic Research Program of China (973 Program, Grant No. 2015CB057502), the Youth Innovation Promotion Association of Chinese Academy of Sciences (Grant No. 2018457), and National Key Research and Development Plan (Grant No. 2016YFF0101000). This research was also partially supported by the Key Research Program of Frontier Science, Chinese Academy of Sciences (Grant No. QYZDJ-SSW-SLH056) and National Natural Science Foundation of China (Grant No. 51673205).